The raised, cylindrical, staight-sided saucepan has an everted lip and applied stepped foot ring. A round disk, soldered to the body below the lip, serves as the footing for a slightly tapered, seamed handle socket that is circular in section. The socket is applied at a slight angle and holds an old, if not original, turned-baluster wooden handle secured with a brass pin. 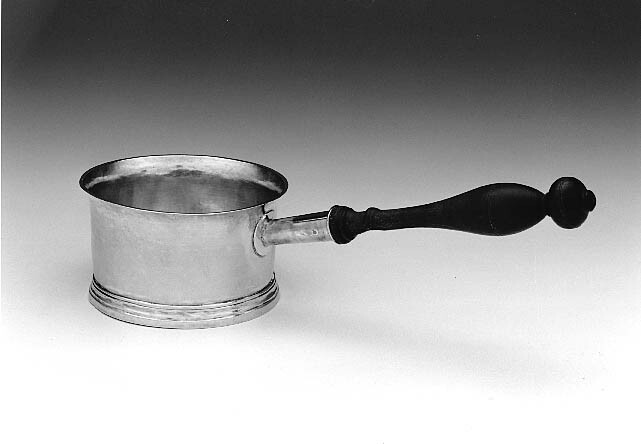 Silver saucepans held liquids that were prepared in the kitchen and transferred to the vessel for use at the dining table. Colonial examples have not survived in large numbers, perhaps due to the damage they suffered while resting in heated chafing dishes. Among Massachusetts makers, few are known. Warmed brandy and butter were but two liquids served in saucepans, and these diminutive pans undoubtedly served many other purposes as well. This example and a similar one by Samuel Edwards (cat. no. 56), Coburn’s likely master, are of the reel-shaped variety that appeared briefly in the mid-eighteenth century. Therefore, Coburn likely learned to fashion this form while working as an apprentice in Edwards’s shop. Coburn’s uncle Ebenezer Storer was married to Mary Edwards, sister to the Edwards silversmiths, and this family connection may have led to his apprenticeship and to commissions such as this sauceboat. This text has been adapted from “Silver of the Americas, 1600-2000,” edited by Jeannine Falino and Gerald W.R. Ward, published in 2008 by the MFA. Complete references can be found in that publication. Italicized engraving on body of vessel opposite handle, reads "The Gift/ of / Mary Storer / to / Isaac Smith Junr / May 7th 1749. 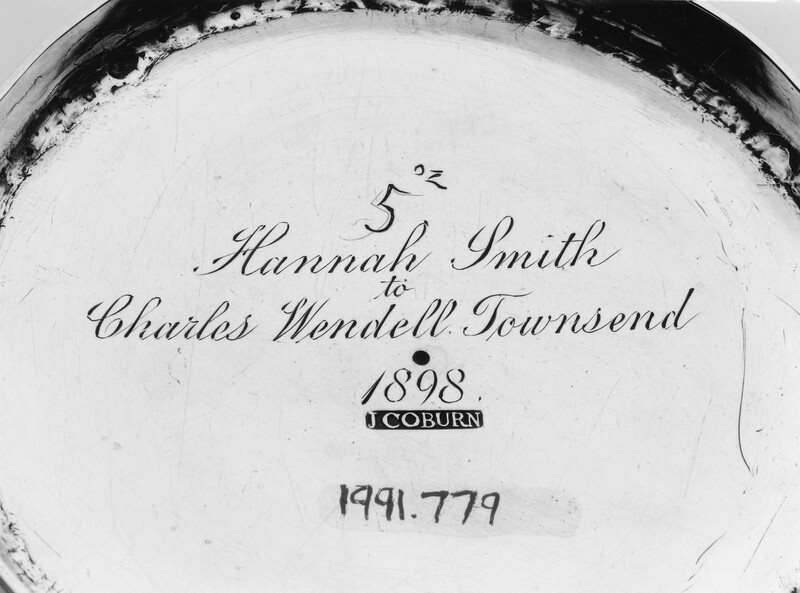 Script engraving "Hannah Smith / to / Charles Wendell Townsend / 1898" in a later hand appears above and below center point. Scratch weight of "5oz " inscribed above the latter text. "J. COBURN" is stamped in roman letters within a rectangle on bottom of saucepan, below center point. Mary Edwards (1700 – 1772), wife of Ebenezer Storer (1699 – 1761), m. 1723, was the daughter of silversmith John Edwards and sister of silversmithing brothers Thomas and Samuel. The inscription implies that she gave the sauceboat as a baby gift to her grandson Isaac Smith Jr. (1749 – 1829). By descent to his great-niece Hannah Smith (1835 – about 1880), who in turn gave it to her nephew Charles Wendell Townsend (1859 – 1934) and Gertrude Flint (1870 – 1917), m. 1891. By descent to their daughter Margaret Townsend (b. 1894) and C. Hale Sutherland (b. 1884), m. 1920; by descent to their daughter Mary Flint Sutherland (b. 1928), the donor.